The Dragaah is in mehrauli, ½ km away from EIDGAAH in north green area. A KACHHA ROAD leads to this dargaah, the road starts from the nrth of the EIDGAAH. It is a very famous DARGAAH. It was built in 1317 by Sultaan Qutubuddin Mubaarak Shah Khilji (1316-20) during his reign. In the east of the DARGAAH, there is a hill on which the CHILLAGAAH of BABA FARID is situated, and the nearby hill around this DARGAAH has been a place of meditation for many great sufi saints. 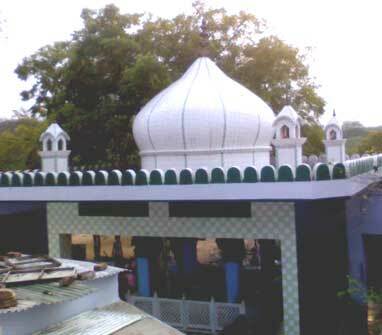 KHAWAAJA Sahib was the son of EMADUDDIN ABDAAL and his KHALIFA. KHAWAAJA was SHEIKH NAAMDAR “DEEGAAN-E-ROZGAAR” of his time. KHAWAAJA also got FAIZ (education) from SHEIKH BADRIDUDDIN GANJAVI. KHAWAAJA reached to the limits of ISHQ-E-HAQQIQI and MEJAAJI. Once on the day of URS of KHAWAAJA’S father ghost (meat) and roti (chapaati) were cooked, but the guests came more than expected and the food was less for them. The khaadims told KHAWAAJA about this, and KHAWAAJA said there is no need to worry. KHAWAAJA asked them to cover the food and don’t open it and look it and open it, and just say BISMILLAH and take out food in the name of ALLAH THE ALL MIGHTY, this will give BARKAAH and everyone will get food. The khaadims did the same as they were told by KHAWAAJA and he food was more than required. When KHAWAAJA left his body 11 ramzaan 717 HIJRI (1317) in reign of SULTAAN MUBAARAK KHILJI, and the food is still cooked there and all the people visiting there are given as TABARUK till now from KHAWAAJA’S LANGAAR KHAANA. (THE FOOD IS HERE LITERALLY IS BEEN COOKED ALL THE TIME).